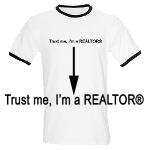 "America's Most Admired Professions=Real Estate Agents"… NOT! Forbes came out with an article reviewing America’s Most Admired Professions and Real Estate Agents were… amongst the bottom 3 in the Harris poll. As a Real Estate Agent and Realtor, this is embarrassing. As you will see throughout this blog, we will try to give you an insider perspective. Also we pledge to never talk you into buying. But if you are ready to buy, we’ll help and make sure you are protected (as much as possible) from a further downturn with an aggressive price drop. This is where my fully disclosed shameless plug will end, welcome to FranklyRealty.com.